I also do not know why I am like this. Some of my friends say that I have a disorder, they say I have an over compulsive behavior. Although, I acknowledge that this is a disorder, I still think that this is far better than being disorganized. Not only you would benefit from this but the rest of the family members. Who doesn't want a clean and organized home anyway? Well, speaking of organization, I was so happy to get this idea of hiding your tools and garden hose by enclosing these in a customized cabinet. This is very neat. I always have problem storing back my garden hose after using it and this storage solution, I think, is worth doing. 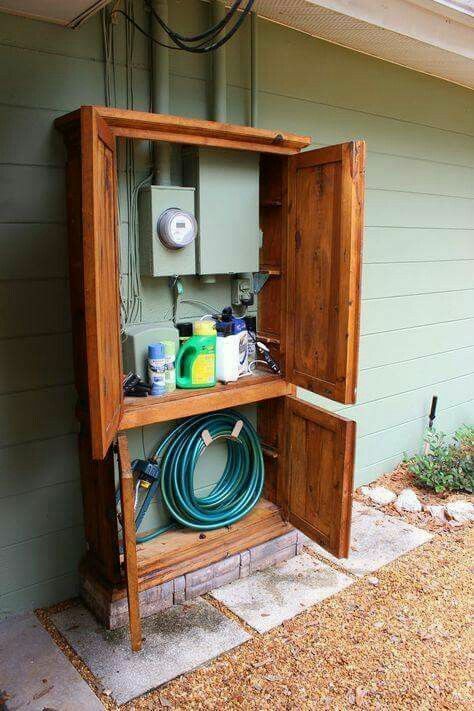 Not only you would hide your garden hose but the extra shelves can also be utilized to store other tools and garden accessories. Isn't it cool?